Personalized under the engraved BOO! design with any family name. Large pumpkin measures an impressive 9"H with 3.5" stem. Quality handcrafted of resin and professionally painted. 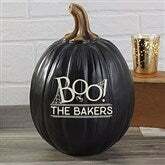 Add some festive flair to your home this Halloween season with our BOO! 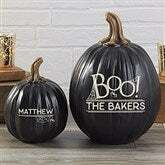 Personalized Resin Pumpkins. Our BOO! personalized pumpkins make great reusable Halloween decorations!